72010-CZ is rated 4.1 out of 5 by 29. Hello, can I use this with a single bowl sink and garbage disposal? I purchased a large single sink and plan to attach a garbage disposal. I would like to have the benefit of a sink strainer as well as the stopper. Can I use model #72030-CZ Flange and Stopper and the strainer from 72010-CZ Flange and Strainer together? I have the Delta Trinsic Touch2O Champagne Bronze 1-Handle Deck Mount Pull-down Touch Kitchen Faucet (Model # 9159T-CZ-DST). 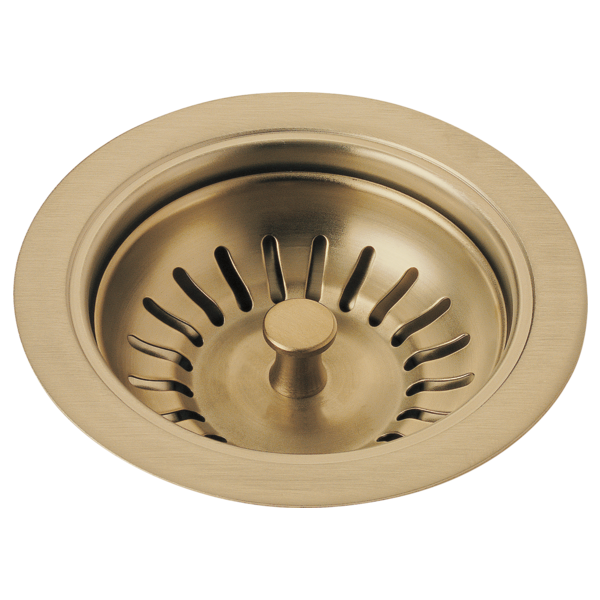 I need to replace JUST the champagne bronze strainer Model#: 72010-CZ (not the flange). Can I order that? does this kitchen drain fit my kohler sink? I currently have the Kohler Whitehaven sink http://www.us.kohler.com/webassets/kpna/catalog/pdf/en/K-6486_spec.pdf. Can I use the delta 4-1/2&quot; diameter brass flange and strainer with my sink? What is the finish warranty on a dispoal flange and basket and strainer?